Joseph Mellor’s parents, Job and Emma, were working class, and very proud of their son’s accomplishments. Including Joseph, there were six siblings, two boys and four girls. Unfortunately, Mellor and his wife, Emma never had children, but he wrote to his nieces and nephews (mainly the children of his sister, Agnes) on a regular basis. In the letters, Mellor used his talents as a cartoonist to entertain them, and to illustrate the stories and anecdotes he told them. While the Mellor Collection does not contain any original ‘Uncle Joe’ letters, Uncle Joe’s Nonsense contains many of the letters in print and was published by the Ceramic Society in 1934. This page recounts a ‘dream’ Mellor had on a bus when a fellow passenger accused him of being a thief. 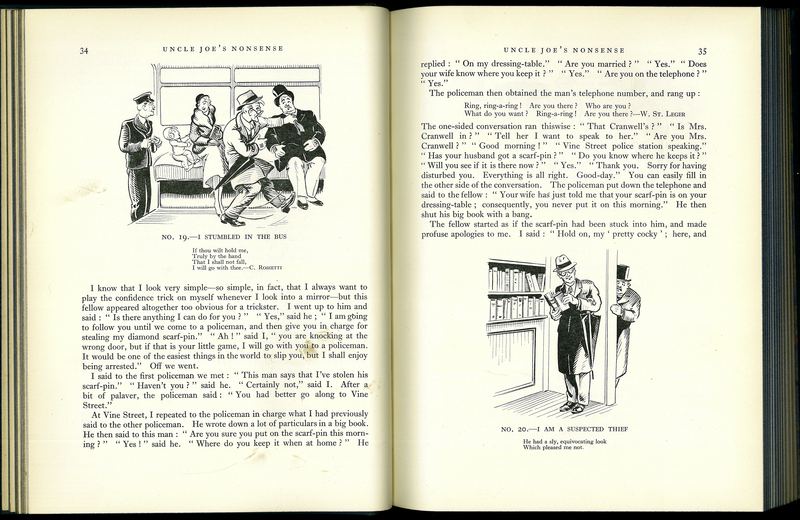 J. W. Mellor, “Uncle Joe’s Nonsense for Young and Old Children,” ourheritage.ac.nz | OUR Heritage, accessed April 22, 2019, http://otago.ourheritage.ac.nz/items/show/11221.